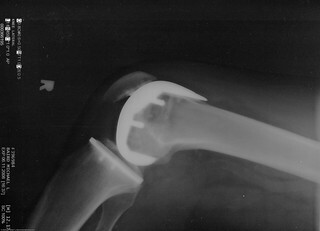 Michael L. Baird's right knee as shown in x-ray 11 June 2008, almost one year after knee replacement (Smith & Nephew Journey Deuce Bi-compartmental unit) in 20 June 2007. Status - still some stiffness and annoying pain and modest swelling requiring some meds - good flexion; strength largely restored - can function pretty much as before. I take photo credits of these x-rays which obviously originated in a hospital lab, to the extent that I scanned the plastic prints outputted from the digital x-ray machine (no film used these days) on an Epson RX680 flatbed scanner and optimized the images in Lightroom - mostly manipulating "curves" to best expose structures. and if purposed online, link to the related Flickr image page. mike [at} mikebaird d o t com indicating which image was used, and if appropriate I will add to the image description a link to your project. You are also encouraged to add a comment to the photo, and add labels to further enhance its visibility. Life is short, and I get a big kick out of seeing others enjoy my images in a responsible way.